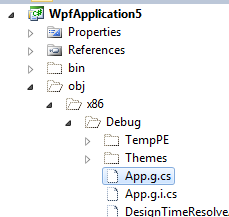 The entry point into a WPF application, the Main function, is quite simple. It creates an instance of your Application object, calls its InitializeComponent method and then its Run method. Double-click to open App.g.cs. You’ll see the body of Main. You’ll also see the body of InitializeComponent. This function merely sets properties on the Application object based on values that you set in App.xaml. By default, this includes only setting the StartupUri property to point to the application’s main window. Update, 20-Oct-2010: InitializeComponent() does a bit more when generated for a Window, rather than for an App. See What Visual Studio Does with Your XAML for details.